Edited with text by Katia Baudin. Text by Erika Balsom, Jasmina Cibic, Vladimir Kulic, Constanze Zawadsky. 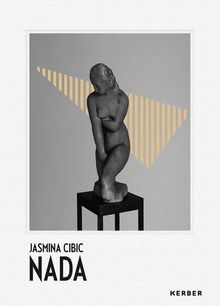 With her works, the Slovenian artist Jasmina Cibic (born 1979) brings together film, sculpture, performance and installation into multi-layered projects that explore how art, architecture and political rhetoric are deployed and instrumentalised in the name of the nation. The publication presents the artist’s latest film trilogy that was developed in cooperation with the Kunstmuseen Krefeld, BALTIC Gateshead, Aarhus, the European Capital of Culture 2017, and MSU Zagreb. Within the three films, Cibic examines the socio-political interconnections of the cultural sector and scrutinizes mechanisms of “soft power” that play a role in the development of national identities.The trilogy culminates in the artist’s site-specific exhibition The Spirit of Our Needs in Museum Haus Esters in Krefeld. NADA is a fully illustrated reader comprising archival material, specially commissioned essays by Erika Balsom and Vladimir Kulic and an interview between the artist, Katia Baudin (Director of the Kunstmuseen Krefeld) and Constanze Zawadsky. It is the first German-language publication (German/English) about the artist. Hardcover, 7 x 9.75 in. / 136 pgs / 41 color / 19 bw.